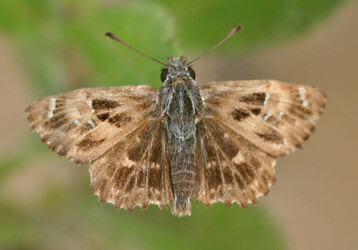 A pantropical group of small, mostly brown skippers. The partially-resolved topology is based on Warren et al. (2008, 2009). Positions of taxa not sampled in the combined analysis are inferred on the basis of morphological synapomorphies and indicated with "?". Warren, A. D., Ogawa, J. R. & Brower, A. V. Z. 2008. 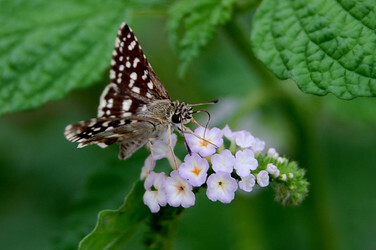 Phylogenetic relationships of subfamilies and circumscription of tribes in the family Hesperiidae (Lepidoptera: Hesperiodea). Cladistics 24, 642-676. Warren, A. D., Ogawa, J. R. & Brower, A. V. Z. 2009. Revised classification of the family Hesperiidae (Lepidoptera: Hesperioidea) based on combined molecular and morphological data. Systematic Entomology 34, 467-523. Page: Tree of Life Carcharodini Verity 1940. Authored by Andrew V. Z. Brower. The TEXT of this page is licensed under the Creative Commons Attribution License - Version 3.0. Note that images and other media featured on this page are each governed by their own license, and they may or may not be available for reuse. Click on an image or a media link to access the media data window, which provides the relevant licensing information. For the general terms and conditions of ToL material reuse and redistribution, please see the Tree of Life Copyright Policies.